FIRST TIP: check the LED itself with a simple bench test. Using a charged 12 volt battery, connect test leads to the battery and then touch the ground (negative) to the base of the LED and the positive lead to the contacts on the bottom of the LED. If it is a 2 contact (1157) style, one contact will give 50% light from all the LEDs and the other contact will give full brightness. It is important to get the polarity correct (ground to the base) or light will not light. This will verify the LED is working correctly. 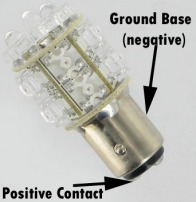 SECOND TIP: 360 Degree Brite Lite Installation Issue on Harley Davidson Turn Lamps. In the Bullet style slim turn lamp housing (found on 2006 and newer HD bikes like Deuce models), the housing is very small and tight where the LED base and top meet. 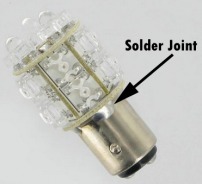 Occassionally, the solder joints that connect the base to the LED top, can slightly interfer with the housing and not allow for the lamp to get the final twist to lock into the housing. It is important to lock the LED into the housing and the fix is simple. The solder around the top of the base can be filed down or sanded to get the high spots off and then re-install. The amount of solder needed to be removed is very little, many times just a few swipes with a file on only the solder joints that extend out from the base. THIRD TIP: Installation Issue and turn lamps don't flash, flash rapidly, or errors on the dash. These issues can happen on newer motorcycles with active computer monitoring systems. 99.5% of the LED turn lamp problems are from the bike itself and not the LED bulb. Keep in mind the typical turn lamps use a load of resistance to trigger the flash rate and this typically will still work until the very last stock incandescent bulb is replaced. Several options exist and many choices can be made. Research your options carefully, as many are model and year specific, and some modules that are plug and play are for specific lighting configurations. Options we have seen used are the Badlands Control module, Kuryakan Load Equilizers and splitters, as well as generic 2 and 4 amp in-line load equilizers. When selecting the best controller for your needs, carefully plan all the lighting changes and research all the versions of modules and load equilizers, as there are many differences and some for only the rear lights, some for all, some are model specific and some are very generic.